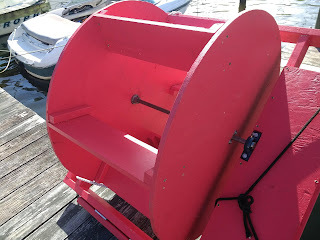 So, rather racing to get a bit ahead of hurricane-induced rainstorms and wind (shouldn't be too bad here, but we will get wet Thursday) we did manage to get the frame and the wheel mated and all the keys in their respective keyways. 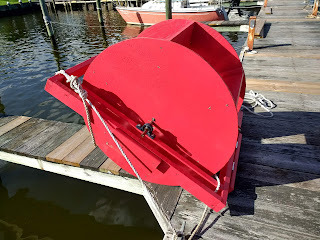 Port side, with the platform for accessing the kayak. Starboard side. Motor mounts at center. I have to admit, I was really pleased. Gail and I picked up the wheel and frame and spun the wheel. It just kept going and going. So the bearings are good and we've obviously got them aligned properly with the shaft. So tomorrow will likely be a waste. Friday we'll still have some winds but it's likely the rain will be done and we can do the last of our touchup painting, then, hopefully with some help, we'll try to get her on Saturday or Sunday. If you're in the path of Michael, stay safe. It's a big storm.